Does this sound familiar? Your company has a website, and you are tracking that in Google Analytics. 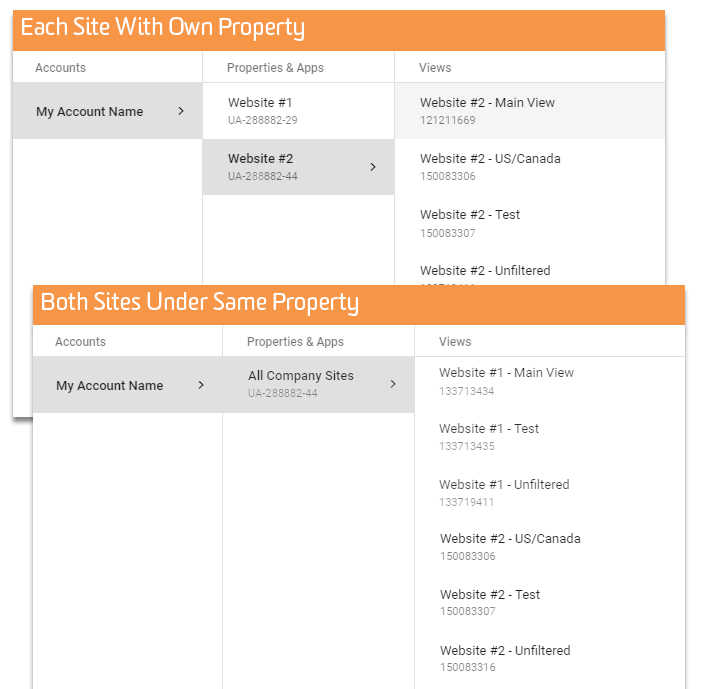 You have one Google Analytics Account, and in that Account you have a single Property. Within that Property you have several Views (your main reporting View, and maybe a few others that filter the data in various ways). Now, your boss comes to you and says the company is creating a new site, and you need to track it. As a good web analyst, you jump into Google Analytics and start to set things up, but then you’re struck with uncertainty. Should you create a new Property (with its own unique tracking code)? Or should you track this new site in the same Property that is already set up (i.e. use the same tracking code on both sites)? If you track it in the same Property, then you could create a new View in that Property to report on this new site by itself. But is that the best way to do it? So you do what any good web analyst does: you start Googling. And that’s what brought you here – welcome! View vs. Property – Help Me Decide! Although Google’s help center articles and developer documentation generally advise you to create a new Property for each website or app that you’re tracking, the best solution is usually more nuanced and dependent on the particular organization’s reporting requirements, along with several other factors. Do you need to be able to easily report on total numbers for both sites in one single report? If so, then you should track it the same Property. Consider the alternative – if you create a new Property, trying to report on total users, sessions, pageviews, etc. across both sites will be painful. Sure, you could use tools like Data Studio, Tableau, or even Excel to combine data from both Properties into one place and calculate the totals. But why put yourself through that trouble? This coincides with the reporting requirements, but is important enough to warrant its own section. Think about this new site, and how it relates to your existing site. Do you expect users to cross back and forth between the two sites? Or will they start on one site, but go to the other to do something important (i.e. make a purchase, fill out a form, etc.)? If so, you will most likely want to implement cross-domain tracking. That way, if a user starts on one site, then goes to the other site, you will count that as 1 user with 1 session in Google Analytics (as opposed to 2 users and 2 sessions without cross-domain tracking). For cross-domain tracking to even be an option, both sites need to be in the same Property – which means they both have the same UA tracking id on them. That’s not all unfortunately, you’ll also have to make sure you follow the steps to make sure cross-domain tracking is set up correctly. For help deciding on whether you need cross-domain tracking, follow this easy flow-chart. 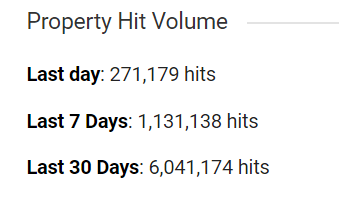 Sampling occurs in Google Analytics when there are more than 500,000 sessions (at the Property level) for the date range selected, and you try to pull a “non-standard” report. This commonly happens when you add a secondary dimension to a standard report or if you apply a segment to a report. If you’ve ever seen the message at the top of your report that says “This report is based on 498,630 sessions (47.36% of sessions)” then you’ve been sampled, or more recently, you may start seeing a yellow shield near the report title. Good read: How accurate is sampling in Google Analytics? So, if your main site averages 475,000 sessions per month, and the new site is expected to generate around 100,000 sessions per month, you’re now in sampling territory for non-standard reports, if both sites are being tracked in the same Property. If the reporting requirements don’t dictate a single Property approach, this factor may nudge you to tracking the new site in its own Property. (For Google Analytics 360 customers, this is less of a concern. Sampling thresholds are much higher – 100 million sessions – and are applied at the View level, not the Property level). Along similar lines as sampling, the standard version of Google Analytics only allows up to 10 million hits (i.e. pageviews + events) per month per Property. If you’re already close to this limit, you may not want to track an additional site into the same Property. If you do, you may be required to limit how much you track to stay within the 10 million hit limit, or purchase Google Analytics 360. Not sure where you stand or already over the limit, check out this post: Google Analytics 10M Hit Limit: What Are My Options? With Google Analytics standard, you are limited to 20 Custom Dimensions (and Metrics). If you expect that you you will need more than that between both sites, you might consider tracking the new site in its own Property, so it can have its own set of Custom Dimensions. If the websites are related and can share the same Custom Dimensions, then it might be better to use a New View. Data import also has certain limitations (at the Property level) related to the size and number of data sets that you can create. If this is an important feature for you, that’s another indication that using separate Properties may be better for you. If you think you’ll need to set different session or campaign timeout settings, you will need separate Properties. For example, if the new site has a lot of video content with videos longer than 30 minutes (the default session timeout), you may want to increase the session timeout. (However, keep in mind it’s not common to change this setting). Most integrations between Google Analytics and other Google products happen at the Property level (e.g. AdWords, AdSense, DoubleClick, etc.). With most of these, it’s possible to have a many-to-many relationship. For example, many Adwords accounts can be linked to a single Google Analytics Property, and a single AdWords account can be linked to many Properties. 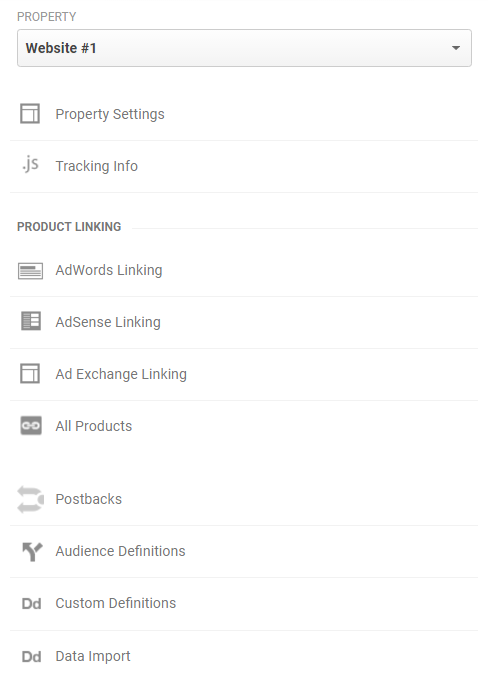 Once linked, you can decide which Views will receive the AdWords data. One exception is the Search Console integration. A single Search Console site can only be linked with a single Google Analytics Property. If you have a single Property in Google Analytics, but multiple Search Console sites that you want to link, you’re out of luck. Another reason to track the new site as its own Property. One limitation that you may run into is the number of Views per Property or the number of Properties per Account. You can have up to 25 Views in a single Property. So if you’ve already maxed that out, you may need to set up a new Property for your new site. (If you work with a Google Analytics Certified Partner like us, we can get this limit increased). Additionally, there is a limit of 50 Properties per account. This limit is reached far less often, but if you find yourself in this position you may have bigger questions than “View vs. Property.” Give us a call, let’s talk. Finally, one last consideration is around data governance. Who needs access to what, and what permissions do they need? For example, if the person in charge of your new site needs to be able to make any changes to the Property-level settings and configurations (e.g. custom dimensions, data import, AdWords linking, etc. ), they need Edit permissions at the Property level. But what if you don’t want to give them Edit permissions to you main Property? Maybe you don’t want them mucking around, possibly making changes that could have negative effects. Remember, if they have Edit permissions to the Property, they also get Edit permissions to all the Views in that Property. They could potentially make changes to goals, filters, default channel settings, or View settings. Is that really what you want? If not, then count this as one more point for the side of creating a new, separate Property. Then, you can give person in charge of this new site Edit permissions just for this new Property only. Wait – A Separate Account?! Lastly, here’s another curveball. Sometimes the answer is a totally separate, completely different Account and Property. If the two sites and the two teams are totally separate – and they both need the ability to manage their own Google Analytics (and not each others) – then you may even consider a brand new Account. Remember that in order to create filters, a user will need Edit access at the Account level, which means they’ll have Edit access to all Properties and Views underneath that account. We talk about that in this post: User Permissions in Google Analytics. It’s important to take time in the beginning to plan your implementation, as your decision will change the tags that need to be added to your site, and potentially settings within Google Analytics. Properties can be moved between accounts if necessary, but you cannot change where the data lives after it has been collected.